The best way to assess intoxication is to observe or test a person’s behavior. Every person will show different intoxication symptoms for the same number of drinks he/she consumes. The law enforcement community observes behavior, but must rely on a legally-defined measure of intoxication. This measure is the blood alcohol concentration (BAC), which is normally obtained by breathing into a Breathalyzer™ device. The BAC is calculated from the concentration of alcohol in the breath. In most states, the legally-defined level of alcohol intoxication is a BAC of 0.08%. Learn more about alcohol and the Breathalyzer™ test. For the same number of drinks, the degree of intoxication and the BAC can vary significantly among individuals depending on the pattern of drinking, body weight, gender, and genetics. In addition, the rate at which someone eliminates alcohol from his/her body is important; because alcohol is eliminated slowly from the body (by metabolism), the BAC will remain elevated well after drinking has ended. If someone is tolerant to alcohol, the rate of elimination by metabolism is most likely faster. 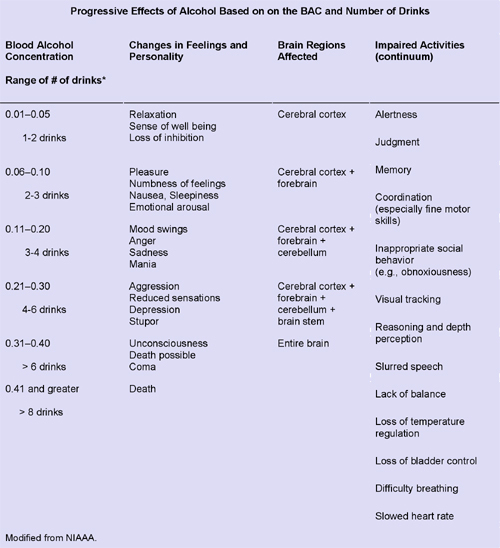 A general association between BAC ranges and the effects of alcohol in the average person can be shown in the table below (Figure 2.7). Note that impairment of alertness, judgment, and coordination can occur at BACs well below the legal limit for driving a vehicle. This has prompted some states to even consider a BAC of 0.05% as the legal limit for driving while impaired from alcohol. Learn more about alcohol and gender differences. The legal BAC limit of 0.08% for intoxication represents a standard of measure and does not precisely reflect the degree to which a person is impaired by alcohol. Figure 2.7 Estimation of how the BAC and effects of alcohol correspond to the number of drinks consumed.